provided me with a great basis to construct a workflow for my clients. As a freelancer, I cannot afford to hire a solicitor to write my contracts so using yours has saved me a lot of time and money." This Partnership Dissolution Agreement is included in editable Word format that can be customized in Word or by using the included Wizard software. 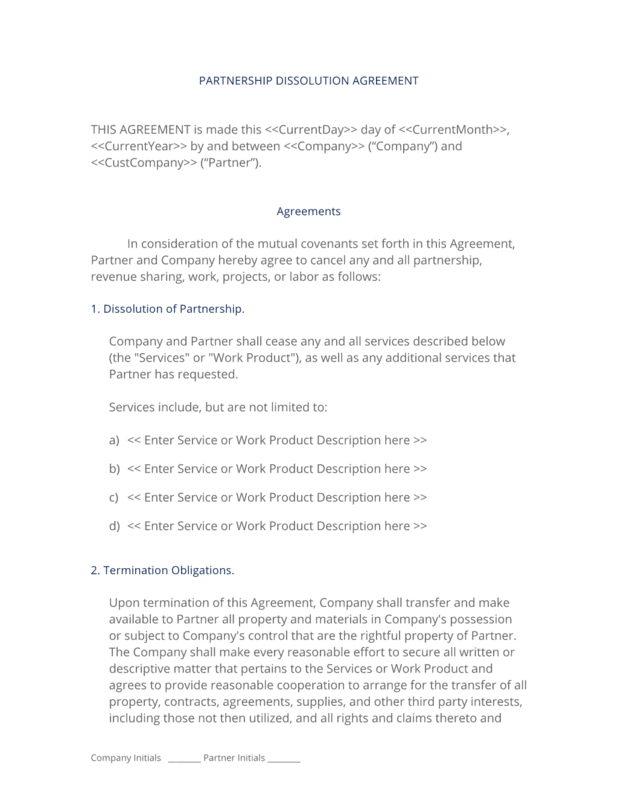 THIS AGREEMENT is made this Current Day day of Current Month, Current Year by and between Company Name ("Company") and Company Name ("Partner"). Company and Partner shall cease any and all services described below (the "Services" or "Work Product"), as well as any additional services that Partner has requested. Enter Service or Work Product Description here. Upon termination of this Agreement, Company shall transfer and make available to Partner all property and materials in Company's possession or subject to Company's control that are the rightful property of Partner. The Company shall make every reasonable effort to secure all written or descriptive matter that pertains to the Services or Work Product and agrees to provide reasonable cooperation to arrange for the transfer of all property, contracts, agreements, supplies, and other third party interests, including those not then utilized, and all rights and claims thereto and therein. In the event of loss or destruction of any such material or descriptive matter, Company shall immediately notify Partner of the details of the loss or destruction in writing and provide the necessary information for a loss statement or other documentation to Partner. Upon termination of this Agreement, each party shall continue to have the following rights to distribute any existing product / service through their normal sales channels and according to the compensation provisions set forth in Exhibit A. Neither party will have any right to decompile, copy, reverse engineer, or otherwise continue development on the Co-produced Product(s). Insert additional language concerning the sale of existing products or service born out of the partnership. The Company shall have ownership of all Company's Materials. Materials that do not constitute Services or Work Product (as defined in Section 1, Services and Exhibit B, Specifications). Materials that are solely owned by Company or licensed to Company. Materials that are incorporated into the Work Product or a part of the Services. Insert description of additional materials here. Company shall hold all right, title, and interest in and to Company's Materials. Partner shall not do anything that may infringe upon or in any way undermine Company's right, title, and interest in the Company's Materials, as described in this section 3 Notwithstanding the above, Company hereby grants Partner an unrestricted, nonexclusive, perpetual, fully paid-up worldwide license for the use or for the sublicense of the use of Company's Materials for the purpose of. Insert purpose of the use of Company's Materials here. The Partner shall have ownership to all Partner's Materials. Materials that do not constitute Services or Work Product (as defined in Section 1, Services and Exhibit B, Specifications). Materials that are solely owned by Partner or licensed to Partner. Materials that are incorporated into the Work Product or a part of the Services. Insert description of additional materials here. Partner shall hold all right, title, and interest in and to Partner's Materials. Company shall not do anything that may infringe upon or in any way undermine Partner's right, title, and interest in the Partner's Material, as described in this section 3 Notwithstanding the above, Partner hereby grants Company an unrestricted, nonexclusive, perpetual, fully paid-up worldwide license for the use or for the sublicense of the use of Partner's Materials for the purpose of. Insert purpose of the use of Partner's Materials here. Outstanding Final Compensation and Hold Harmless Agreements. For all of Company's services rendered to Partner, or vice versa, under any Previous Agreement, the party owing monies shall compensate the owed party, in cash, pursuant to the terms of Exhibit A attached hereto. By accepting the terms of this offer and signing in the space provided below, each party hereby releases and forever discharges and holds one another, its successors, employers, employees, agents, officers, directors, shareholders, affiliates, and insurers harmless of all claims, suits or liability, directly or indirectly related to employment, retainment of services or the termination of such services, and specifically and without limitation any claims to pay in lieu of notice, wrongful dismissal, severance, vacation, bonus, or overtime pay. This release includes, but is not limited to, all contract and tort claims between Partner and Company concerning either party's right to terminate its employees, contractors, and vendor agreements and claims or rights under local, state, and federal laws prohibiting employment discrimination. By signing below, both parties agree that these terms represent a full and final settlement of any and all claims either party may have arising out of any previous contracts or arrangements, monies owed, or any other obligations required to be met by either party. Partner and Company acknowledge and agree that the Specifications and all other documents and information related to the performance, production, creation or any expression of the services or work product are the property of Partner. Materials provided between Company and Partner (the "Confidential Information") including, but not limited to, documentation, product specifications, drawings, pictures, photographs, charts, correspondence, supplier lists, financial reports, analyses, and other furnished property shall be the exclusive property of the respected owner (the "Owning Party") and will constitute valuable trade secrets. Both parties shall continue to keep the Confidential Information in confidence and shall not, at any time during or after the term of this Agreement, without prior written consent from the owning party, disclose or otherwise make available to anyone, either directly or indirectly, all or any part of the Confidential Information. Excluded from the "Confidential Information" definition is anything that can be seen by the public or had been previously made available by the owning party in a public venue. If Partner has made available to Company, for Company's use in performing the services for Partner, such items of hardware and software as Partner and Company may agree are reasonably necessary for such purpose, Company is obligated to return all Partner's property currently in its possession at a time and place of Partner's choice. The following equipment has been made available to Company and is hereby required to be returned to Partner. Neither party will be reimbursed for any expenses incurred in connection with the Services or Work Product, whether direct or indirect, unless otherwise written in Exhibit B. This Agreement shall be binding upon and inure to the benefit of Partner and Company and their respective successors and assigns, provided that Company may not assign any of its obligations under this Agreement without Partner's prior written consent. Company has no right to assign, sell, modify or otherwise alter this Agreement, except upon the express written advance approval of Partner, which consent can be withheld for any reason. Partner may freely assign its rights and obligations under this Agreement. In the event any party to this Agreement employs an attorney to enforce any of the terms of the Agreement, the prevailing party shall be entitled to recover its actual attorney's fees and costs, including expert witness fees. Both parties represent and warrant that, on the date first written below, that they are authorized to enter into this Agreement in entirety and duly bind their respective principals by their signature below. The complete Partnership Dissolution Agreement - with the actual formatting and layout - is available in this Contract Pack.